Emma Ruth Rundle in interview: "When times are hard on the road, I envision Portugal’s ocean, streets, food, hills and friendly faces"
Emma Ruth Rundle is an american singer-songwriter, guitarist and visual artist, that you may also recognize from Marriages, Red Sparowes and The Nocturnes. On September 14th, Emma released her latest album, On Dark Horses, via Sargent House. It is her fourth full length studio album and it is already considered by many one of her best works so far. Next week, she'll be playing with Jaye Jayle in Portugal (Porto and Lisbon) and we had the opportunity to ask her a few questions before these shows. The full interview can be read below. Congratulations on your new album, Emma. The reviews have been great so far. Do you feel those positive vibes regarding On Dark Horses? ERR: Many thanks. It means the world. One never knows how anything will be received and I feel very lucky. When did you start thinking about this new album? Did you write it between tours? ERR: I started preparing for the album between tours in the summer of 2017, in Louisville, but got really down to it in the winter - early 2018. We believe that there is a certain evolution in the albums that you’ve been composing throughout your career. Do you like to change your approach towards composition or do you think it just happens as you’re writing? ERR: I think it’s natural for any artist to change mostly whether it’s an evolution or not. I don’t think my approach changes much overall in that I wrote everything on the same acoustic guitar but for ODH I had a full band in mind. Now, in a more cliché question, what are the artists and bands that influenced you? ERR: I’d have to say that much of USA's rock radio from the 90's really influenced this album. You played with some great musicians last year and they are part of this new album: Evan Patterson, Todd Cook and Dylan Nadon. How do you feel playing with them? ERR: I feel extremely lucky to have such brilliant musicians on the album and on tour. I also love them as family and there’s not much more anyone could ask for in that regard. You're starting a US/Europe tour. Do you have some preference between playing "home" or abroad, in Europe? ERR: I prefer Europe and UK over US because I am treated so well there and feel appreciated. Any special feelings about Portugal? 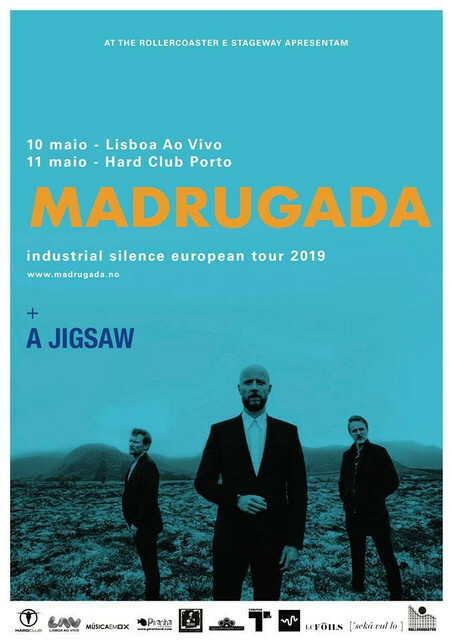 ERR: I was in Portugal last year for three solo shows and I’ll probably spend the rest of my life trying to describe how magical my last trip to Portugal was. Many thanks to André and Vera for taking such good care of me. When times are hard on the road, I envision Portugal’s ocean, streets, food, hills and friendly faces that I’ve experienced. It’s a place I would love to stay for some real time. You’ve been part of the Sargent House family for some time. Do you consider them essential in your career? ERR: Yes. Without them, I don’t think I would have made it far. Do you have plans to keep your current support band in the future or maybe return to "flying solo"? ERR: I’d like to continue to support On Dark Horses with a full band but my plan is to make an acoustic solo album next year. What have you been listening to in the last couple weeks? ERR: Cloakroom, Wovenhand, Yob, Torche, Beak, Tinariwen, Thou and 40 Watt Sun. Thanks to Emma Ruth Rundle for taking some time to answer us and we're really excited to see her next week in Portugal!